I saw a post on Facebook today that asked about favourite cookbooks. They didn’t mean websites, or even online recipes, but rather the good old-fashioned cover-to-cover tomes of cook’s notes on paper. I wanted more than just a tiny comment box to record my thoughts on the matter, so here I am. I’m hoping that my choices may interest someone else – or perhaps a reader may have a cherished volume whose name they will share. Do I need to mention I have more than one favourite? If a favourite volume is designated as such by its frequency of use, then my stained journal with all the recipes of my childhood would win hands down. All my old stand-bys are in there and not only do I make them regularly, I also share them with friends and relatives. They aren’t on the internet in a way I can find them unless I put them in this blog, so the weathered pages are my kitchen bible. When I needed my Auntie Maxine’s foolproof Yorkshire Pudding recipe, that’s where I wrote it. I still use it, and when I get long distance phone calls asking for it, I like it to be handy. As for published cookbooks, The Frog Commissary Book has been a good friend for many years. This collection comes from two popular eateries (The Frog and The Commissary) in Philadelphia. It not only has plenty of practical everyday recipes like Frog Commissary Cookies , the margins of its pages are filled with handy tips about cooking and entertaining, like how to set up a bar for 50 people or an illustrated set of instructions on making lemon crown garnishes. The other old friend I would not want to be without is The Chatelaine Cookbook, published in 1965. When I want a recipe for a preserve, or something like waffles or tomato aspic, that is where I look. There are few photos, no tales of how a recipe came about – just straightforward instructions. It’s what my grandmother would have told me if I asked about a recipe. For a cooking style as a theme, I still have a fondness for Southwest cooking and my copy of Mark Miller’s Indian Market Cookbook is as useful as it is beautiful. Going to the Coyote Cafe in Santa Fe was on my bucket list for years, but now I live my dream through the pages. Our warm summer climate and relatively mild winters are a good fit for the aromatic and often bold flavours, and I enjoy growing chiles and herbs in the garden that I use in these recipes. Rosemary Pecan Bread is from this book. My mom gave me a copy of Larousse Gastronomique not long after I returned from my year living in France. I had spent much time while there researching French recipes through history, and it helped with some of my translations. 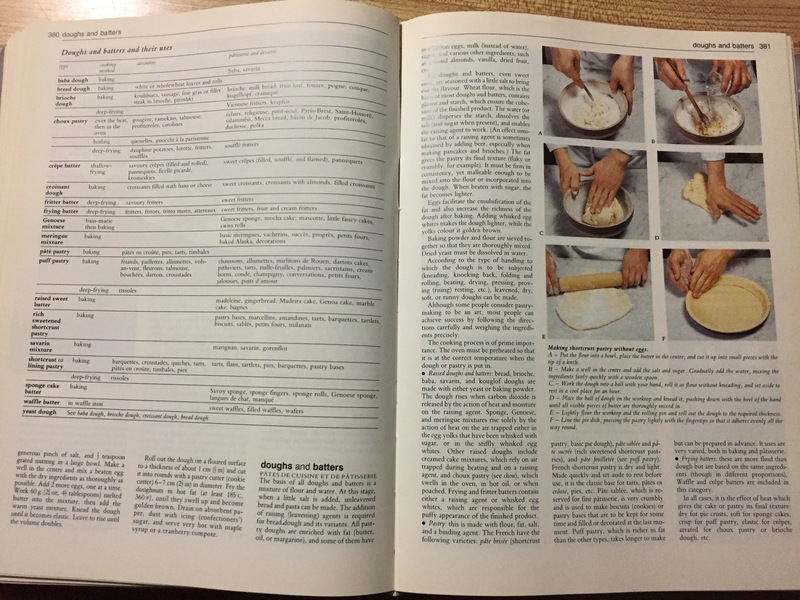 The encyclopedia format means you need to know what you’re planning to cook if you want a recipe; it is equally as interesting only as a reference for classic European cooking. I have a bookcase full of cookbooks, and I don’t use them all as much as I would like. Still, their presence is a comfort and an inspiration. I guess it is a reflection of my age that the feel of a book in my hands and the action of flipping through pages is much more comforting than typing and tapping through an internet search. 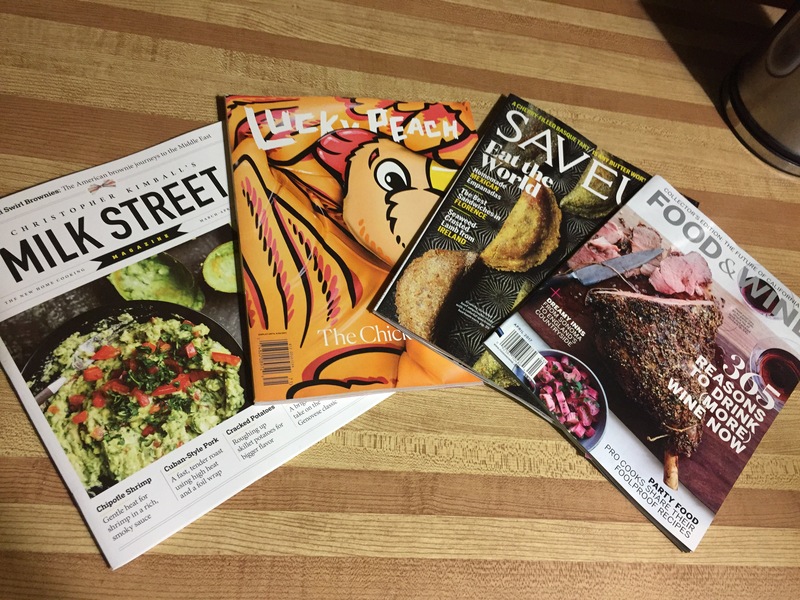 Do you have a favourite cookbook, or did you eschew your collection for an online app? How do you find recipes, and save those you want to make again? I’d love to hear your comments. I’ve been in this kind of situation in the kitchen when I did movie catering. I remember the first time I cooked brownies for 100 people on a catering truck while parked on a steep hill. I had to think fast when they came out of the oven – there was a thicker end to the baking pan of batter that was a big brownie (more like cake) and a thinner end that was more like a biscotti. I could not choose “game over” as an option, the cast and crew had to have dessert. So I iced the thick half and dusted the thin half with icing sugar. I cut the pieces smaller and served up a choice: chocolate wacky cake AND biscotti. It worked, even though it wasn’t the original game plan. I did make a note to myself to prop up the pan the next time we cooked on a hill, though. When you get rained out, you learn a lot. We got rained out tonight for dinner. We were supposed to meet friends at a local restaurant to catch up on all our news, as we hadn’t seen each other in months. We wanted a place on the Westside so it would be close for all of us. She made reservations. We pulled up first and found the restaurant closed up. We knew it wasn’t open for lunch and we had arrived early… we checked the website and it said they were closed Mondays. So we texted our friend; perhaps she had made a mistake when reserving? She and her partner pulled up a few moments later, and she told us she had specifically asked if they were open since the website said otherwise. The staff said of course and took her booking. when things don’t look good, we try to think outside the box and see other options. It took only a minute or so before we had come to a consensus. Many small restaurants are not open Monday, something we can sympathize with since we know weekends are the busy days. We brainstormed and quickly found someplace close that was open and headed out. So I’m sorry, Thai Fusion , but I can’t offer any commentary about your experience. It’s a shame, as we don’t get out that often and I like to support small businesses. Unfortunately since part of my expertise lies in customer service I have to say that you did lose out when you had a staff member so out of it they never realized even after taking a reservation that they booked clients for a night you’re not open. You missed an opportunity to win. As a result, 19 Okanagan Grill and Bar got our business tonight. They welcomed us with open arms and smiles, and took good care of us all evening. The drinks were fun and tasty; my Pineapple Ginger Margarita was the perfect beverage for reminiscing about my Mexican holiday. The food was hot and full of flavours. I had plenty of fish tacos in Mexico, and I already know theirs are good so I chose the Butter Chicken Bowl. I was pleased with the abundance of veggies, chicken and rice; the hot naan bread was a perfect accompaniment. My hubbie said his Cajun Burger was just right too, with a good kick of heat, fresh lettuce and tomato and hot fries. Our friends were both happy too – apparently the Caesar cocktails are at least as good as the Margaritas. I’m glad I was able to support a neighbourhood business tonight. I am thankful that we got some quality time with friends, and a fun memory to share. Thanks, 19, for keeping us out of the rain. You’re a winner in my eyes. I’m sure we’ll see you again soon.